Yet again I've deleted a post before uploading it from my iPad, I'll get the hang of this Blogsy yet but until then….. darn! 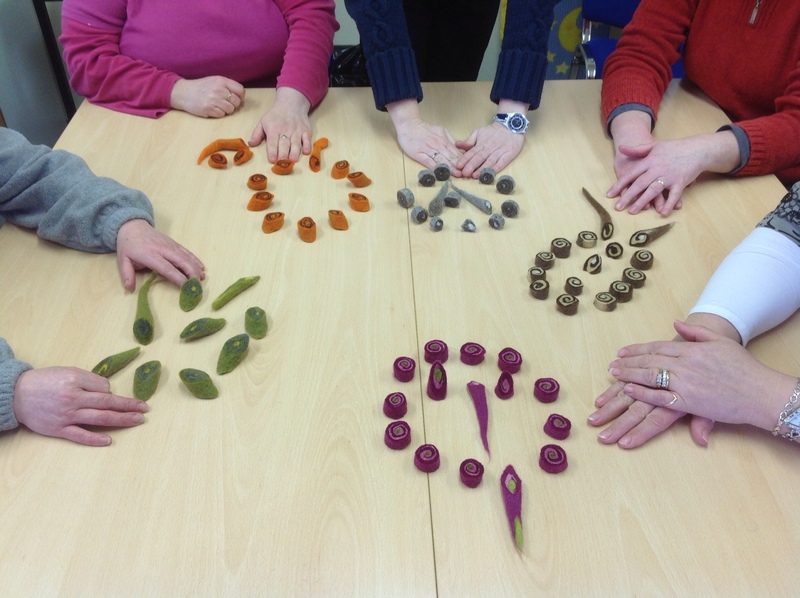 What I wanted to share today is a picture of the beautiful felt beads made this morning by my group of parents at the VEC in Carlow. This was our third and penultimate session, next week Nuno felt samples. I'm SO impressed with how productive these ladies have proved to be, our co-ordination Marie has generously allowed participants to bring fibre home to practice with so some amazing pieces have been felted over the last three weeks. After our final session we're going to take pictures of the full body of work, I think that you'll all be amazed how much has been created! For now, here's a picture of todays beautiful swirly beads. I accidentally deleted the previous post as I was just about to publish so forgive me now if I'm brief. 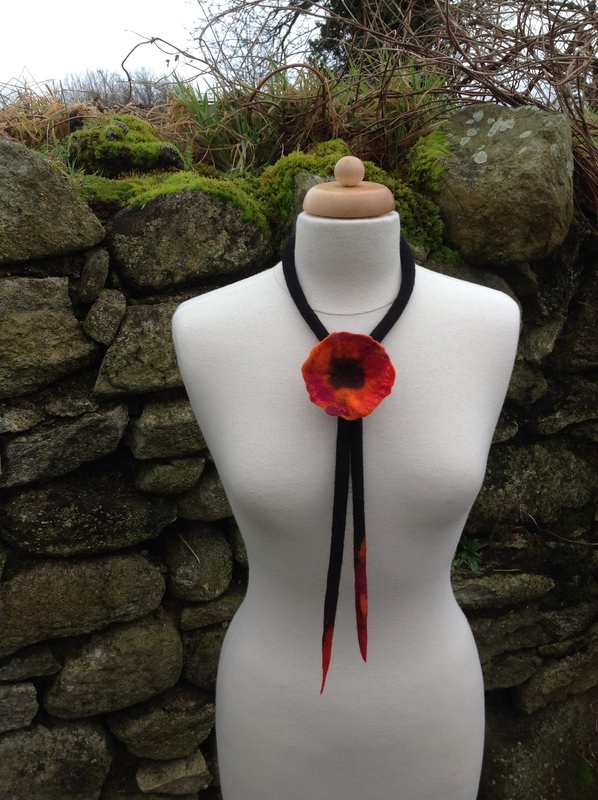 On Saturday 18th May I'll be facilitating a full day nuno scarf/neckpiece workshop at the KSFF and on Sunday 19th a half day fun felt flower class, two classes if we get enough sign ups over the next couple of months! Roo Kline from Moonwood Farm is sponsoring the yummy hand dyed alpaca and delicious embellishing fibres we'll be using for the nuno felt workshop and I'll be bringing some of my favourite short fibre merino from Ireland as well as a selection of different fabrics for participants to choose from. Thanks to Roo's very generous sponsorship this class will only cost $100 per participant including all fibre, fabric and embellishing materials, thanks Roo!!!. The short fibre merino I'm bringing with me is also what we'll be working with for the flowers on Sunday, here's a picture of some which were completed during the 2012 classes, so stunning and colourful. The price for the flower workshop is $30 per person plus $10 for the materials, participants can expect to make 3 flowers each during the class! Keep an eye out on the KSFF website as booking for all their great classes should be possible shortly, as soon as I know that it's live there I'll post a link here on my workshop page. Beautiful flat felt and flowers! I've no brain power left to write today so thought instead that I'd share a couple of pictures of the fabulous felt created by students over the last two days. Congratulations to you one and all!!! 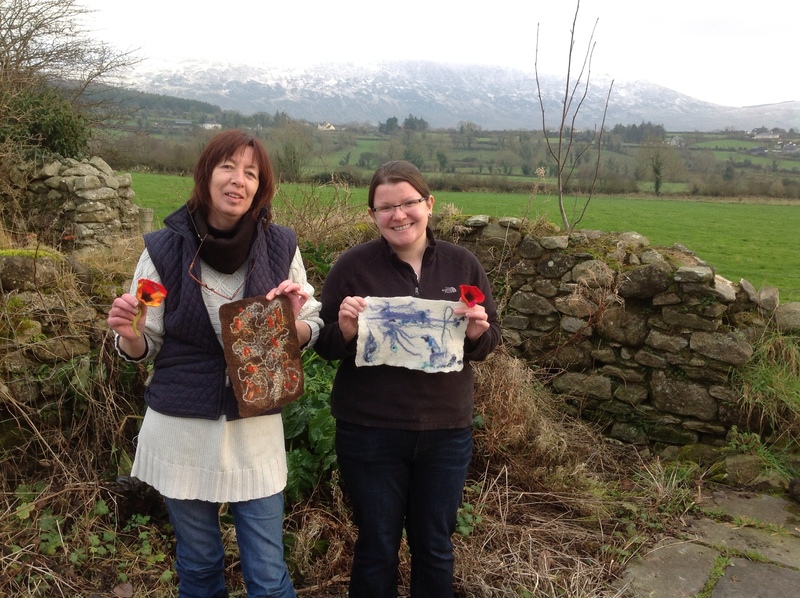 First off here are the wonderful pieces of flat felt created by Anita and Ariane, they even had time to felt a flower each yesterday, pretty impressive for their first time felting! 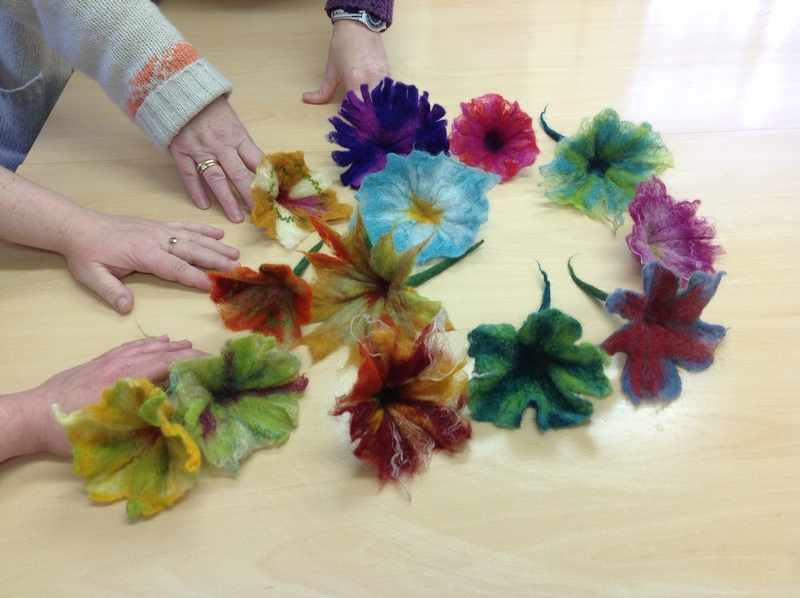 Secondly here's a group photo of the beautiful flowers felted this morning by the parents group I'm working with at Carlow VEC, fabulous result ladies for our second time felting together! A short little film from The Tin Thimble! Thanks to Maggie Celeste Worden for filming some of the felting workshops I facilitated at The Tin Thimble last September, Maggie's now posted the edited video to YouTube so if you'd like a look here's the link. It's really a snapshot from several days, a little of the nuno felting, some other snippets and a few nice shots of The Tin Thimble itself. Thanks Maggie! Flower bolos, fun, funky and versatile! I've just completed the cords for 4 flower bolos this morning as I want to bring them with me to Borris Food and Craft Market in the morning. Here's a picture of one way to wear them, head on over to Clasheen on FB to see two more ways to accessorise an outfit! I'm just going to grab a quick lunch then into the studio to gather my things for the morning. I just wanted to let anyone who might be interested know that I’m offering a workshop exploring the basics of flat felting for beginners and improvers next Tuesday, 22nd January at my house in Clasheen, Ballybrack, Borris, Co Carlow from 10.15am until 4.15 – 4.45pm. Flat Felt Sample – I don’t know why this is showing upside down but never mind, I can’t seem to change it! During this workshop participants will have fun learning and experimenting with the fascinating technique of wet felting. Working with a selection of colourful wool and adding silk, linen and other vegetable fibres each participant will have the opportunity to felt a beautiful piece of flat felt suitable to be framed, used as a place mat or stitched into a clutch bag or book cover. 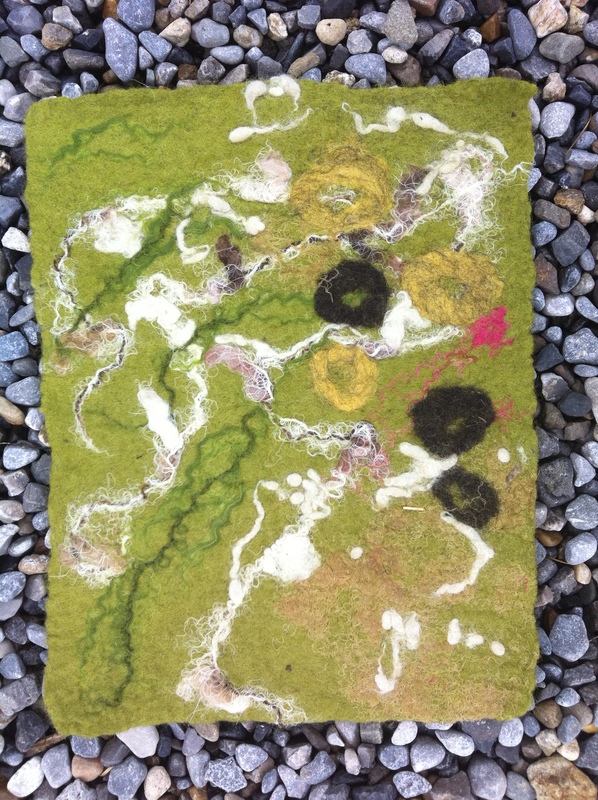 Improvers will have the opportunity to learn new techniques such as including found objects and resists into their work during the layout stage of the felting process. The emphasis during the day will be to have fun in a creative and supportive environment, participants may expect to leave with the knowledge and confidence to replicate the techniques learnt successfully at home! The fee for this workshop is E75 including all materials, tea, coffee and soft drinks. Participants are asked to bring their own packed lunch and wear comfortable, warm clothing, the workshop will run from 10.15am sharp until 4.15 – 4.45pm with a break of approx one hour for lunch. Please contact me asap to reserve your place, I have a maximum of three places left! I’m confirmed my dates for teaching in the US during May and Portugal in June so am now really trying to concentrate on writing up the workshop descriptions. No matter how many times I promise myself I’ll start a file to collate and store all this info once more I’m floundering around trying to put words to paper, words obviously that will give potential participants an idea of what I’m hoping we will cover during the classes! I’m also sorting out dates for upcoming workshops at Duckett’s Grove, watch this space. Anyway, the dates are now on the workshop page so please excuse me while I go and strain my brain some more…..